There are a few tricks to ensure you attract the biggest audience possible online. Here’s what we know. Listing your home for £799,999 or £895,995 is a bad idea. Buyers search for a home on Rightmove in set brackets: £700,000 to £800,000 and £800,000 to £900,000 and so on. A home priced at almost £800k is better being £800k on the nose as it will show up in two different search bands. People use filters and keywords on websites to narrow their results. It's important your agent understands how to write and upload your advert effectively for filters and keyword search. There's a strict word count to consider as your advert will not perform well if the first few sentences are cut in the listing. We’re told exactly what works best by the portals we use. The optimum number of photos for a flat is around ten. For a house, it’s between ten and twenty. People don't click through forty photos and research has shown they're more likely to leave the page if they're looking at the same room from several angles. Use the best shots of each room and leave something to the imagination. Your agent should rotate your photos every couple of weeks. This absolutely improves click-through rates. Ideally, your agent should make sure a couple of extra photos are taken with this in mind. If your main photo has been the same for a month, call your agent and ask them to change the photos around. There’s nothing wrong with asking your agent for a fresh round of pictures if you feel you need them. Ask for your Rightmove report, your agent can send it across by email. It shows how many views you’re getting online, what your click-through rate is and something else that’s very useful—how your property is performing compared to similar ones. 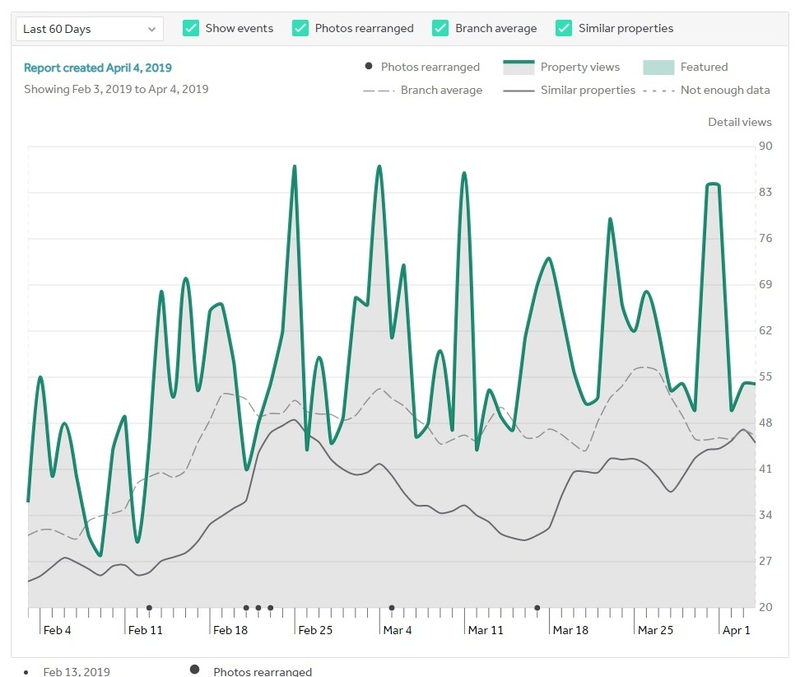 You can see how many views your home is getting each day (they give a total too) and the effect of a photo switch, price reduction or a premium listing. In this example, the house is getting plenty of attention online with way above-average results. Because of this, we don’t feel the price is wrong and know the marketing is working. We’re also actively looking after the listing by regularly switching the photos and can use this report to show our client that the advert is performing well. We knew the next home was a bit expensive, but the client wanted to try a higher price than we suggested. 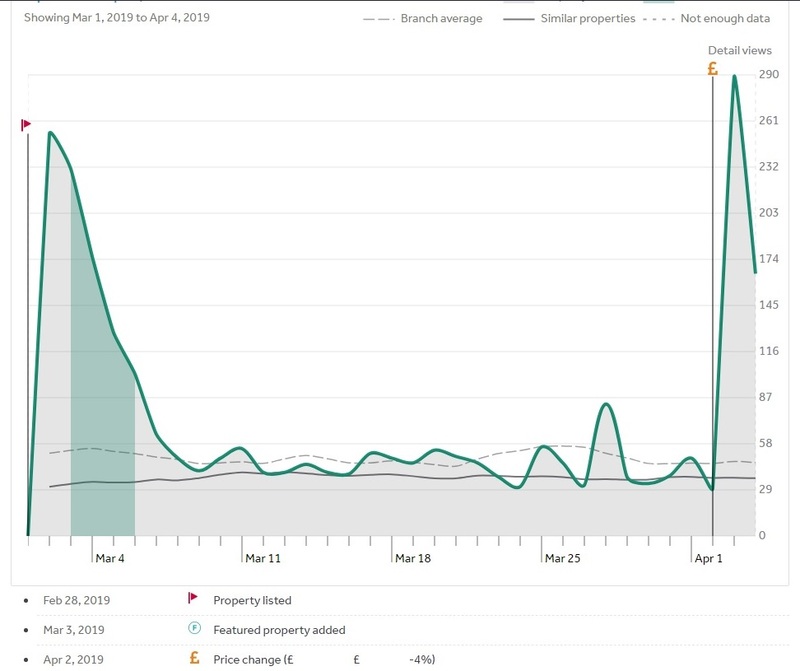 Rightmove send a round of email alerts when the property is uploaded, hence the large spike just after the little red upload flag. Then interest dies off. Luckily this client recognised things weren’t working and quickly adjusted the price in line with our recommendation. The portals are wired to resend another round of email alerts as soon as a property reduces by at least 2% and due to this, Rightmove notified hundreds of buyers, with 290 of them clicking through to look at the full brochure. Because the price is now more realistic, we'd hope to keep interest up just like in the first image. In fact, we've already got a second viewing. These tips will help you get better results with your online marketing. We're happy to help if you're struggling with your sale or wondering what your home is worth. Drop us a line at post@roybrooks.co.uk.